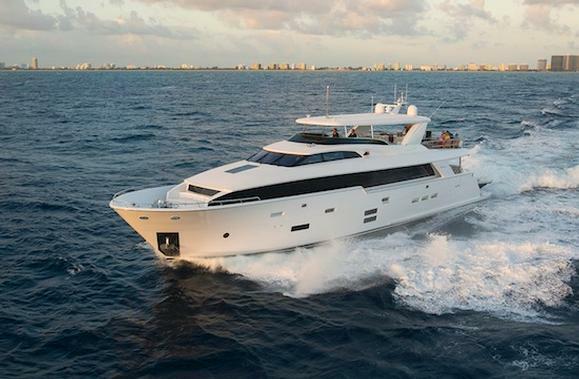 Elegant and powerful, the Hatteras 100 Raised Pilothouse surely is an eye-catching new addition to the extensive fleet of USA-based Hatteras Yachts shipyard. Hailing from New Bern, North Carolina, Hatteras Yachts has been a leading force in building sportfishing convertibles and luxury motor yachts for over 50 years. With the launch of this exemplary new flagship, the yard is providing us with a promising glimpse into their future. A future of forward-thinking superyacht design, exquisite elegance and technological excellence. Slender lines, an unmistakably modern silhouette and generous amounts of feminine boldness make the Hatteras 100, or 100 RPH, perfectly pleasing on the eyes. However, as is the case with all great luxury yacht design, there is so much more to her than meets the eye. What about her impressive performance and top-notch technology? And the extraordinary craftsmanship that can be found throughout every interior and exterior area onboard? It's all in the details, and the Hatteras 100 has been detailed exquisitely. With half a century of knowledge and experience in building the finest vessels, Hatteras Yachts has delivered an aesthetically pleasing, top-performing superyacht that seamlessly combines exciting adventure with exquisite luxury, refined style and soothing comfort. Impressively, much of her onboard amenities are typically found on vessels of a much larger size, making the 100 RPH all the more intriguing. She finds a way to present her guests with such an inviting and spacious ambiance, and a heavenly level of luxury, that one often tends forgets Hatteras 100's convenient size. Being just over 31 metres in length (or up to 33m including the optional hydraulic swim platform), she features the largest aft deck and saloon in her class, adding a luxurious sense of airiness both inside and out. Guests will undoubtedly enjoy this open ambiance, which facilitates the lush sense of freedom that life onboard a superyacht is all about. The optional on-deck master suite, as one of this flexible model's many possibilities, perfectly illustrates her knack for combining convenience with luxury. Ample options are available, such as a transom garage and the aforementioned on-deck master quarters, however additions such as Zero-Speed stabilisers, bow and stern thrusters and top-notch AV-systems are standard. And among today’s fiberglass yacht builders, the new Hatteras 100RPH is the largest production motor yacht to offer a 10-year structural hull warranty. Her sportive exterior elegance is complemented with a solid set of exterior areas, all stunning and vibrantly spacious. A thrilling observation lounge in the form of a big, cozy Portuguese deck, the place to be when cruising and an undeniable guest favourite, the panoramic aft deck, perfect for al fresco dining and elegant entertaining, and a generously appointed, massive flybridge, for soaking up some sun to late-night cocktail parties, hold the key to every guests' comfort for exterior life onboard Hatteras 100. Overall, there is a very laid-back yet refined and stylish ambiance to be enjoyed here. If her exterior areas are all about versatility, airiness and splendid comfort, Hatteras 100's interiors are all about elegance and luxurious style. They show off a warm and open design, particularly for a superyacht of this size. Hatteras 100 perfectly combines the convenience and efficiency of a practically-sized vessel, with the grace, luxury and onboard ambiance of a much larger luxury yacht; an appealing combination that is one of her many highlights. As mentioned, the main saloon is wonderfully spacious and, upon entering, clearly boasts a inviting, stylish atmosphere. Modern classic, with a light colour palette and a pleasant emphasis on natural, luxurious materials are key here, and everywhere onboard. Large windows allow the flow of natural light and frame the contemporary classic design scheme with some lush vista views. This open plan saloon, with spacious lounge aft and formal dining fore, seating up to 8 guests, is subtly formal yet inviting: a great combination. The impressive eat-in galley fore extends Hatteras 100's wonderful sense of hospitality, and the luxury of enjoying meals in such a big, cozy setting, framed by stunning panoramas courtesy of large windows throughout, is simply a bliss. Below decks, three perfectly appointed guest suites, two central twin suites and one big VIP fore, and one large, full beam master suite form this luxury yacht's range of guest accommodations. Here, too, refined style is combined with luxurious, natural materials, such as hardwoods and stone, and perfect craftsmanship, showcasing that this is truly Hatteras Yachts' finest yacht to date. With regards to style, the guest suites continue her design of contemporary classic elegance, with some highly contrasting, yet always natural tones such as dark chocolate, beige and off-white. These light, warm colour palettes wonderfully frame the designs of sleek, modern lines and finely balanced shapes, resulting in an ambiance of luxurious softness and refined modern hospitality. Each stateroom is obviously accompanied by a luxury en suite, in a light, modern design, with the master quarters offering the additional luxuries of his and hers en suites and wardrobes. Hatteras 100's exterior decks and interior volumes can be easily compared to those found of superyachts of a considerably larger size, making her all the more impressive. As such, she combines convenience with impressive amenities, which makes her as appealing as she is charming. An elegant vessel, boasting sportive and refined exterior features, spacious and elegantly modern interior designs, an overall ambiance of classic finesse and soft, subtle luxury, Hatteras 100 is a splendid superyacht that is not merely a new flagship for Hatteras Yachts, but a luxurious home for those lucky enough to spend some time onboard. Every guest will surely have a marvellous time from the moment they step onboard. Last but not least, the new Hatteras 100RPH is the largest production motor yacht built in fiberglass today to offer a 10-years structural hull warranty.